Macon Georgia is a unique city where culture, commerce and community flourish. 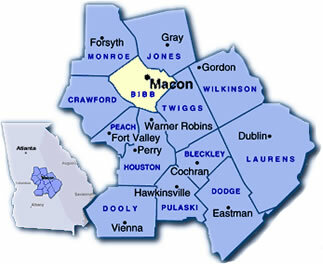 Conveniently located in Central Georgia at the intersection of 1-75 and 1-16, Macon, located in Bibb County, falls between Atlanta, Augusta, Savannah, and Albany. Macon is part of the historic South and mixes a rich cultural heritage of music, landmarks of the past, halls of fame, shopping, great restaurants and much more!